This project resulted in what is now my favorite shirt. The best part? It cost me 2 dollars and took half an hour. AND, no hemming, because it's a cotton knit! -A blank cotton Tshirt - either new or used, but it needs to be as big as possible. Michaels has them for 3 dollars, sometimes on sale for 2. I wear a small and bought a XXL, but I also only used about half of the extra fabric. 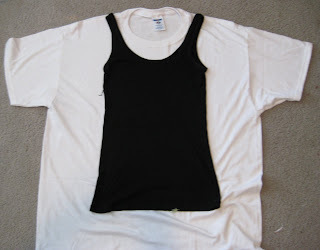 Step 1: Lay out the tank top on top of the t shirt. Line up the part that goes over your shoulders with the fold on the t shirt. Make sure it's centered, or it will fit weird. Step 2: Cut it out! First, cut the bottom strip off so the length is correct.Keep in mind how tightly the tank top you're cutting around fits, and how much tshirt material stretches (it does, but not as much as ribbed tank tops do!) Either way, leave at least about an inch on each side as a seam and error allowance- you can alter it to fit better later. Make sure that the shoulder pieces stay together (so the back and front are still connected). Cut out the desired shape and depth of your neckline as well. Step 3: Sew the sides together. Now let's look at the fabric you cut off. First, look a the strip you cut off the bottom. You'll want to cut this in to strips about 3/4 of an inch. You will need at least a couple of these; I would suggest three. If you don't have enough fabric to do this, you'll have to use some of the fabric you cut off the sides for it. These strips will be for the roses, which I'll get to later. The picture below doesn't show these (sorry). 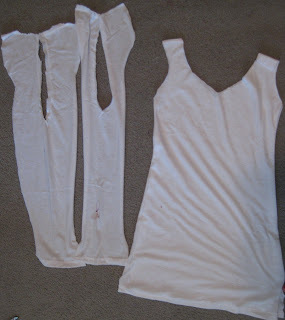 Step 4: Cut the sleeves off of the extra side material you have. Then, cut the shoulder, so it lays flat. Now, you'll cut the ruffles out. Measure around your neckline, from front to back to front again. Multiply this number by somewhere between 1.5 to2 (2 will be fuller ruffles, 1.5 will be a little more subtle), then cut strips from the fabric and sew them together to get the correct length (that got when you you multipled before). When do you this, make sure you cut a smooth line as these won't be hemmed! Any jagged edges will show and look bad. 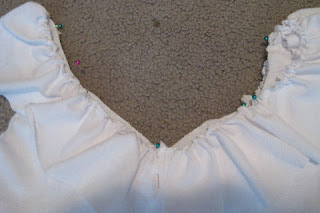 Step 5: Sew the ends of the ruffle together (so you have a loop), then do a running stitch down the length of it. Gather and pin to your neckline with the shirt INSIDE OUT, and the raw edges together. 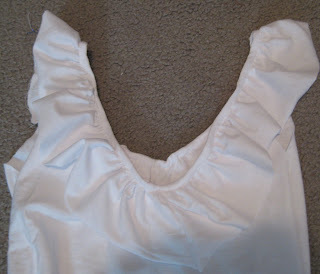 This way, whe you turn the shirt right side in, you should be able to flip the ruffle over and the raw edges will be hidden. Flip the ruffle, the sew it in place all the way around. 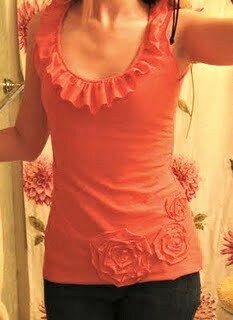 Check back tomorrow for part two: making the rose appliques! I promise they're super easy (each one took me about 2 minutes) and look beautiful! Love!! Can't wait to see the roses tomorrow! I love your directions. I am new to sewing and blogging, I am definitely going to try this! 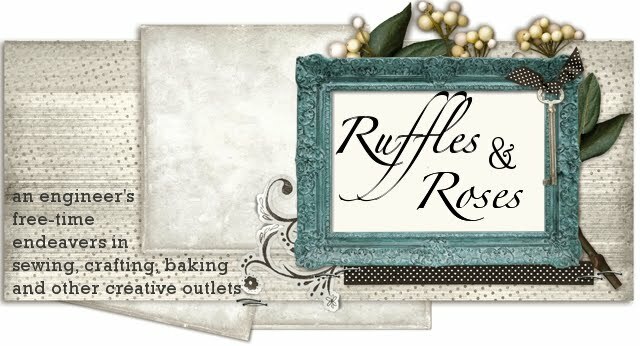 Do you remember how long your ruffle was? I really want to try this. But maybe just have a front ruffle. Hi Justine! Generally when I make ruffles, I do them a length and a half to two lengths of what I want the finished length to me. So, if I want a ruffle 10 inches long, I use a strip 15-20 inches long. Does that make sense? Amber, How wide was the ruffle on the neckline? Not how long, but how wide? Thank you! ANOTHER adorable tank...cant wait to try one! Thanks for the inspiration! Yes, that does make sense, thank you! This is nice! I love it. Made this today and LOVE IT!!!! I wish I had a way of sharing a pic but I don't have a blog. this is cool but can you make it into a dress? How wide is the ruffle? And when you say sew so it is a loop, are you folding in half and sewing the two ends? I did this last week, I had several tshirts that are to big for me, but when I cut them I did not cut the sides off, just opened them and cut the sleeves and left it long on the bottom as I like my shirts to cover me. weird thing is, it became to tight, not what I wanted it to look like on me but it will work out for around the house, yard work. I’m prompted while using the surpassing in addition to preachy checklist you give in such very little timing. Really, This kind of is an awesome post. I actually enjoyed the info lot. I actually will bookmark this site. Thanks for sharing this information and facts. 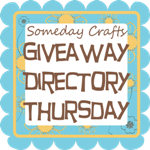 Pictures, future tutorials, and etsy!